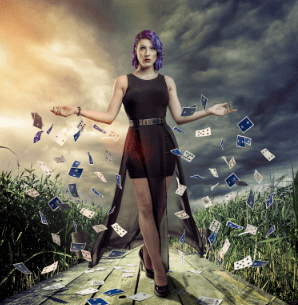 As her name suggests, Jasz Vegas performs a style of magic that is unlike any other performer on the scene. She combines it with her dazzling burlesque skills, has edge and brings a truly contemporary feel to the magic and burlesque scene. You may have caught Jasz on BBC Three’s Killer Magic pilot in April, and if you enjoyed the show, you’ll be pleased to know it’s back for a full series in the Autumn on BBC Three. In the podcast we do discuss the trick she performed on there, and if you’d like to see it, it’s on the Killer Magic tv air date page here. You can find out more about Jasz by liking her Facebook page here, and following her on Twitter @JaszVegas. If you have iTunes, you can click here to subscribe to the Geektown Podcast, or just click below to listen or download!